Brigadeiro is the most popular dessert in Brazil. A type of truffle that is so easy to do. It only requires 3 ingredients. 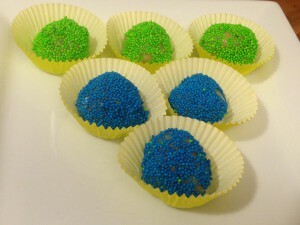 These are the must have sweets in any brazilian birthday party. Also, it’s the most popular sweet among teenagers. ¼ cup of powder chocolate ** NOTE: you can change this part with shredded coconut, nuts or cashews. In one medium size pan, add condensed milk, butter and chocolate and bring it to boil in medium heat, mixing it throughout the entire time. Aprox. 10-15min. After it reach boil, remove the mix from the stove and pour it in a bowl. Refrigerate for 2 hours. If you decide to change the chocolate, do the mix with only condensed milk and butter. After is done you add your choice of third ingredient and then refrigerate. Use a little butter on your hands to roll the mix in small balls. Roll the small balls in sprinkles. Voila! I was inspired by the World Cup so I decided to do mine with coconut instead of chocolate and I rolled them in blue and green sprinkles. You can also roll them in more coconut, sugar, nuts… anything you want! Son los dulces que los ninos mas adoran, en fiestitas de cumpleanos.